A full set of pictures can be found in our galleries, here. 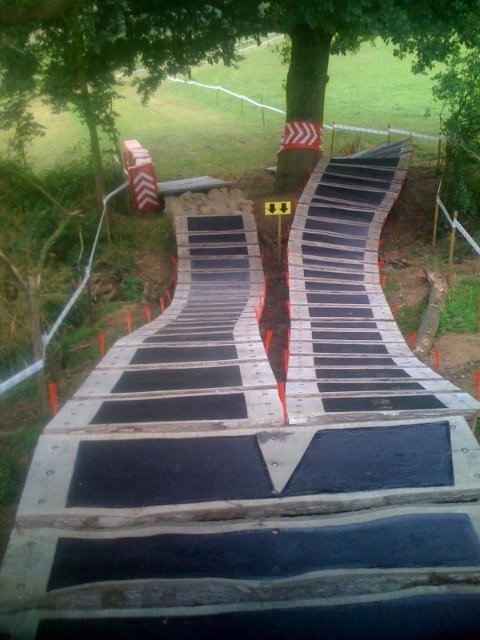 The Hadleigh Olympic Course was built by Course designer and builder Martin Seddon, (M&L Seddon). Martin’s exemplary qualifications as an elite mountain bike racer who competed in many World Cup races in the ’90s combined with his day job as a groundworks contractor, held him in good stead as the UCI went on the hunt for the man who could take on the job of transforming, what on paper seemed like a most uninspiring venue into a fantastic showcase for the sport in the London 2012 Olympics. Martin was incredibly underwhelmed when he discovered the venue was planned for the flat lands of Essex. 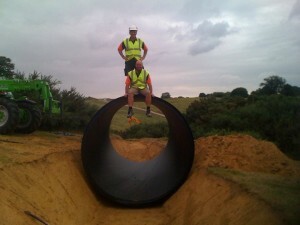 “To be fair when I was first asked to visit the site I was very skeptical, there are no hills in Essex! It was only when we actually got to the ridge that we could see straight away what the potential was. After a year of working on designs, contracts were signed just two weeks before we started building way back in July 2010. “The brief was to build the toughest, most technical, spectator/camera friendly olympic mountain bike course ever seen, all within a 5km loop. Which we absolutely achieved. “The hardest part about the build had to be the weather. It was awful. We experienced the wettest summer since records began followed by a winter of heavy snow. But despite this we got it built on time. During the build we manhandled over 3500 tons of rock. 500 tons went into making all the rock features, whilst the rest was used for base stone and top grade for the track itself. Glenn Horton - (Rockogolist) also now HMTBC Chairman. We all agreed "constructing the course nearly broke us". All those late nights we put in to make sure it got completed on time… The most satisfying aspect of the whole job was the turn around of riders’ opinions of the course. Every elite athlete admitted it was so much harder to ride at race pace than they had ever imagined. 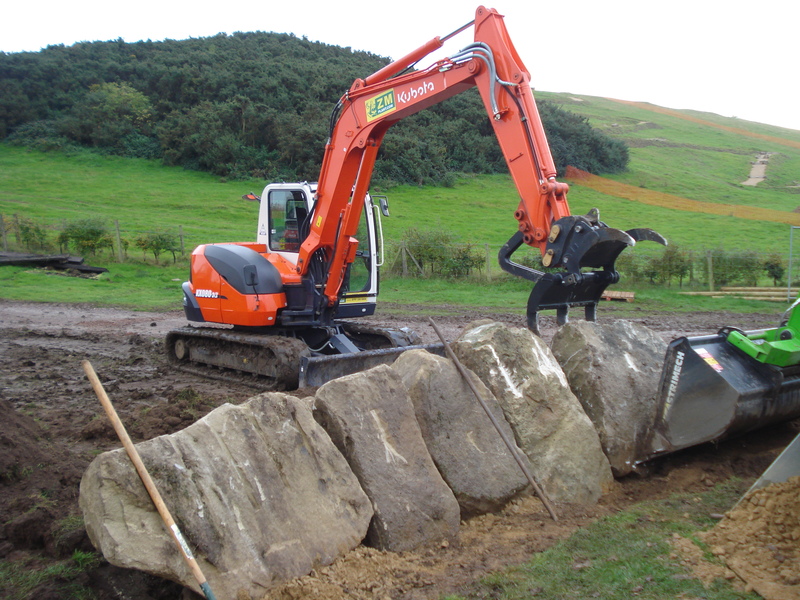 Every time a load of large rock got delivered, I couldn't sleep with excitement! All the large rocks were separated, then chosen individually for each feature. I still remember Martin’s face when the single launch rock on the 'A' Line of Triple trouble was placed first!! This was and still is the most scary single rock on the whole Olympic course! During the main nine months build we were given estimated lap times which started at 15 minutes then dropped to 13 minutes due to TV slots of 1 hr 45mins. 2004/8 Olympic champion Julian Absalon claimed an impressive win and in the women's race the 2011 world champion Catharine Pendrel claimed the title. All work was then carried out during winter 2011. 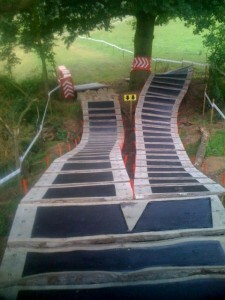 A few maintenance weeks prior to the 2012 Olympic MTB event. The course was Race Perfect! If anyone wants an Olympic Course touch to their trails!